he Schools of European Martial Arts in New Zealand have officially been operating since 2004. We are entirely dedicated to reconstructing European Martial arts from historical martial art treatises, and to keeping existing living traditions alive. The earliest text from which we work is the I.33 Tower Manuscript. This is the earliest known fencing treatise of Europe, and was written circa 1300 in Germany. It is written primarily in medieval Latin, with some German of that period. There are a great many other texts which have been discovered, dating from shortly after I.33 onward. These were written in countries ranging from Burgundy, England, and Italy. Other German fencing treatises from the Middle Ages have also survived. There are also much later fencing treatises from across western Europe and from many different epochs of history. These later treatises include martial art manuals from the Renaissance, the period known afterwards as the Enlightenment, the Age of Regency, and the classical period. They cover many disciplines from unarmed (grappling, punching and kicking styles), knives, daggers, stick fighting, even bigger stick fighting, pollax, halberds, and the Queen of weapons, the sword, in a variety of incarnations. Once a year we used to run a New Zealand Western Martial Arts convention, which draws in interested parties throughout the nation. The first such convention was held in 2006, and was very successful. The Schools of European Martial Arts in New Zealand had their early beginings largely in the New Zealand re-enactment community. Many of its founding members thereby came to HEMA through an unrelated discipline of stage combat. The first attempts at interpreting European martial art treatises started in 1997 in Auckland. Originally, the focus was on attempting a marriage of Western Martial Arts and stage combat; but in the end this proved impossible. In 2000 a much stricter and separate experiment with Living History was attempted. While interesting and fascinating, since much was learned from wearing period clothes and footwear, the task of trying to do both living history and martial arts was too taxing. In 2004 a course in sword and buckler based on our interpretation of Tower Manuscript I.33 was undertaken. Many more courses were attempted after this. Halls were hired, and more days added. During this time, the more recently-formed Hamilton school became affiliated with the Auckland school, and thus the organization known as the Schools of European Martial Arts New Zealand was born. In 2007 the school in Upper Hutt decided to affiliate with the School of European Martial Arts name to become the Upper Hutt School of European Martial Arts. Also in this year the former head instructor of the Auckland branch moved to the Wellington region and is in the formation of setting up a brand new and permanent school based in Lower Hutt. In May 2014 the Wellington school ran a master class workshop on Tower Manuscript I.33 (sword and buckler.) We covered off the seven common fencing guards in response to the blockading/beseiging position half-shield. We then looked how the other counter positions worked to help the person in half-shield change and continue to blockade against the common guards. Our interpretation tends to differ from a number of I.33 schools; half shield breaks the attack and is the cause to adopt the common guards...rather than half shield being adopted against someone holding the common guards. One of us even remembered to take a photograph for once. In April 2013 the Wellington school ran a master class workshop. The workshop covered common terminology and motion, wrestling, dagger, Tower manuscript I.33 (sword and buckler), and longsword from the Liechtenauer and Liberi traditions. The main emphasis was to promote knowledge of perhaps controversial interpretations and see if practitioners from around the country could break said interpretations in their own practices. The workshop was very well received. Throughout 2012 the Upper Hutt school ran a series of workshops in aid of the then forthcoming 2013 Harcourt Park Jousting tournament. These concentrated on medieval dagger, sword and buckler and sword in two hands. The idea behind them was to try and bring a wider audience to historical European martial arts without overwhelming them with said arts. They were well received. This Convention was held opposite to the Waiwera hotpools in the middle of winter. 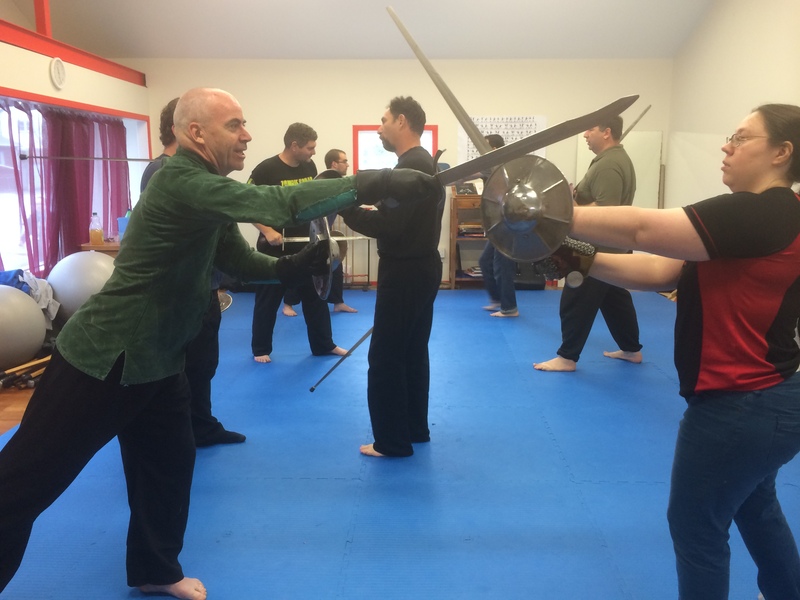 Our guest presenter from Sydney, Australia was Paul Wagner with workshops being run on Elizabethan backsword, English two handed sword and staff. Dean ran a workshop on biomechanics, Tristan on Burgundian pollaxe, Dominic on German longsword and Colin on German wrestling, Italian rapier and English bare knuckle boxing. We had a good representation from people ranging from Whangarei to Christchurch. The weekend was a great success with people unfamiliar with HEMA suddenly appreciating what their ancestors knew. One such memorable quote was "It works. How does it work? It shouldn't work, but it does." Others familiar with HEMA went home with even greater enthusiasm for the arts. After a year hiatus the Convention returned; this time at the Upper Hutt Martial Arts Academy in late summer. Our guest presenters came all the way from Wisconsin, USA. Bob and Kristi Charron brought with them an immense amount of knowledge. Bob on the system written down in Flower of Battles by 15th century Italian fencing master Fiore dei Liberi and medieval education of the nobility and priesthood, and Kristi on horsemanship from the Middle Ages. Bob's instruction on Flower of Battles was amazing (something to be expected given he's a leading authority on the subject). The influence of a medieval education was demonstrated over and over again in the interpretation. Not only do they have that, but the bio mechanics were extremely sounded which meant that they would be repeatable under duress. Bob's interpretation has greatly changed over the years and was almost a completely different entity from when the author first trained under Bob. What was surprising was how much more similar this art form was to the contemporary German system. In addition Callum ran workshops on German I.33 sword and buckler, Tristan on Burgundian pollaxe, Marinus on German falchion (messer) and Colin on Italian rapier, English bare knuckle boxing and French walking stick. Due to the enormity of last year's undertaking and the brilliant timing of an economic downturn things were scaled back this year. Like last year the Convention was held at the Upper Hutt Martial Arts Academy, but in winter. We decided to focus on developing NZ talent rather than bring over a guest presenter. Colin ran two workshops on German longsword, Callum ran two workshops on Fiore dei Liberi's sword in two hands, and Dean and Lezle introduced a new subject to the Convention with military sabre also in two workshops.